Filling your kitchen with very dark colours will make it appear smaller and more cramped – especially if the room doesn’t receive much natural light. 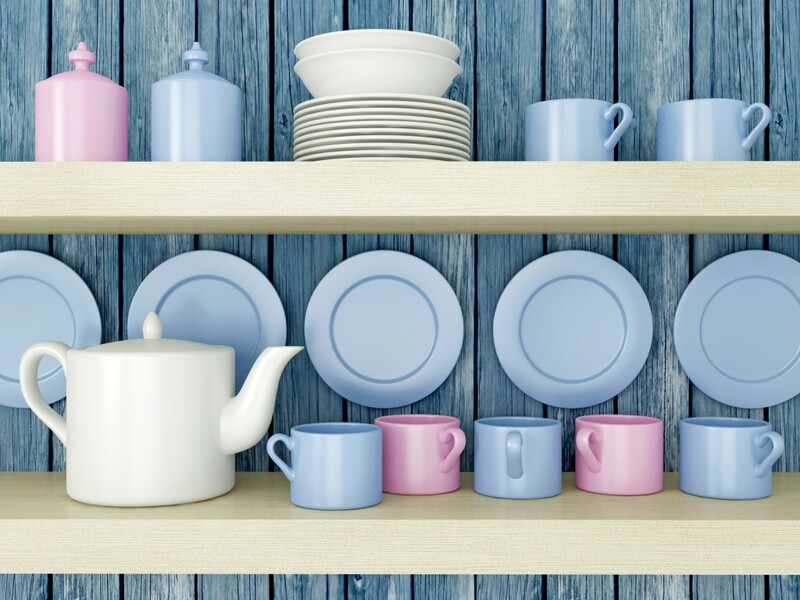 Keep it bright and airy by opting for lighter, more vibrant colours in your kitchen. 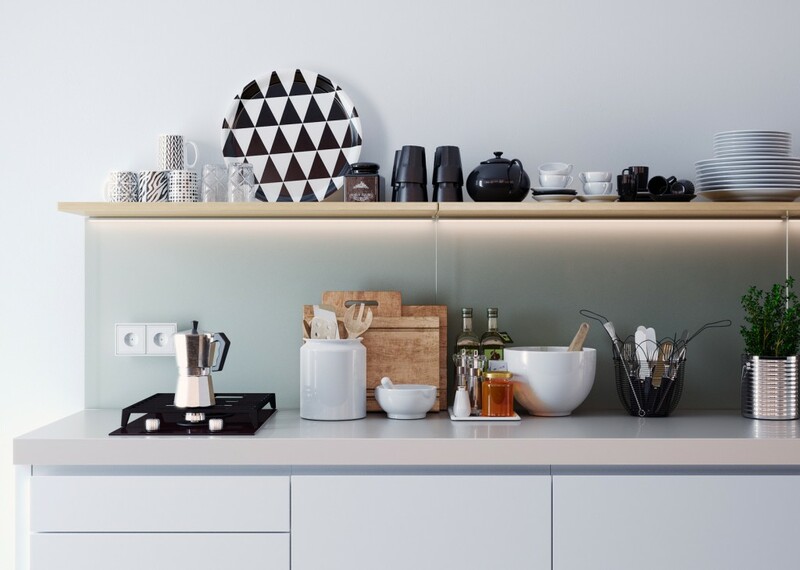 Whether it’s kitchen doors, work surfaces, or small appliances, light colours will help open the room up more and instantly make it feel more roomy. And the great news is that you don’t have to opt for plain white. Colourful kitchens – peachy pinks, lemon yellows, and green mint – are right on trend this year. If there’s one thing the average kitchen is full of, it’s dead space. There’s so many unused nooks and crannies in kitchens that could quickly and easily be transformed into useful storage space. Think about the inside of your cupboard doors, for example – it’s wasted space. So why not make it more beneficial? Use sticky pads to attach a small wastebin to the inside of the door so it’s not taking up space on the floor. Or hang a small basket on the back of the door to hold little kitchen essentials such as cleaning products or bin bags. Simple! There’s only so much floor space and worktop space in small kitchens, but there’s plenty of wall and ceiling space, so make the most of it. If you’ve got a tiny kitchen, then shelves are your new best friend. Build upwards, not outwards, and store your kitchen bits and bobs as high as you can reach. There’s even been a growing trend lately for fresh herbs in pots to be hung from the ceiling, with their leaves cascading down. Not only is this a great space saving solution for the kitchen, it’s also a great talking point for guests (and yummy, too!). You’ll have to find somewhere else to store the school term calendar this year – that fridge door space is needed! While magnets from your latest summer holiday may make your kitchen look pretty, they’re wasting valuable space. It’s time to get creative, and use strong magnets to hold small storage pots onto your fridge or freezer door. This works best for storing very lightweight items and objects so they don’t fall – dried herbs and spices are ideal. This means all your favourite spices will always be right there on hand, too, for easy cooking. Following on from the concept of building upwards, not outwards, did you know that there are wide range of kitchen appliances available that are made to be stacked on top of each other to save space? Separate fridges and freezers can be stacked to make a ‘fridge freezer’, and washing machines and tumble dryers can also be stacked. You can purchase low cost stacking frames that ensure your appliances remain safe and secure, even when they’re in use. This is a great way to maximise your floor space and reduce that cramped feeling. The trick to loving your small kitchen? Make it your own! Customise the layout by building upwards, not outwards. Change the theme with a quick splash of light, vibrant colour. 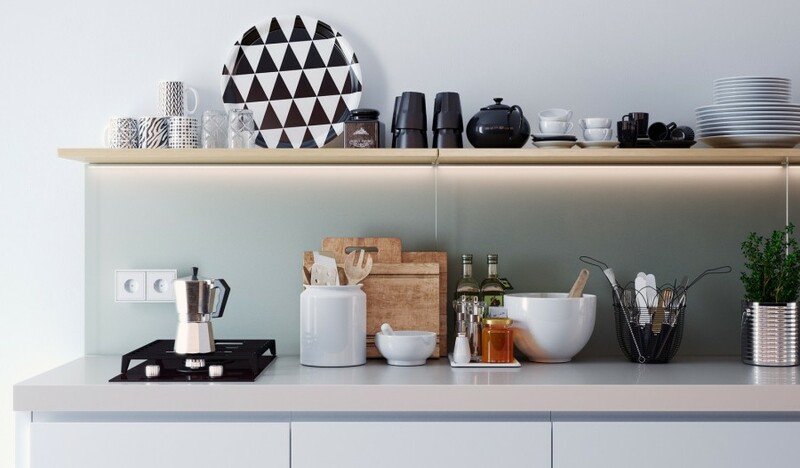 Create your own unique storage solutions to reduce clutter and keep your kitchen well organised and looking great. There’s nothing you can do in a big kitchen that you can’t do in a small kitchen (and there’s less mess, too! ).